Extensive interior & exterior remodel of a two-level ranch home. Exterior work demolished an unused 2-story brick chimney and second level deck to add windows for relevant views. 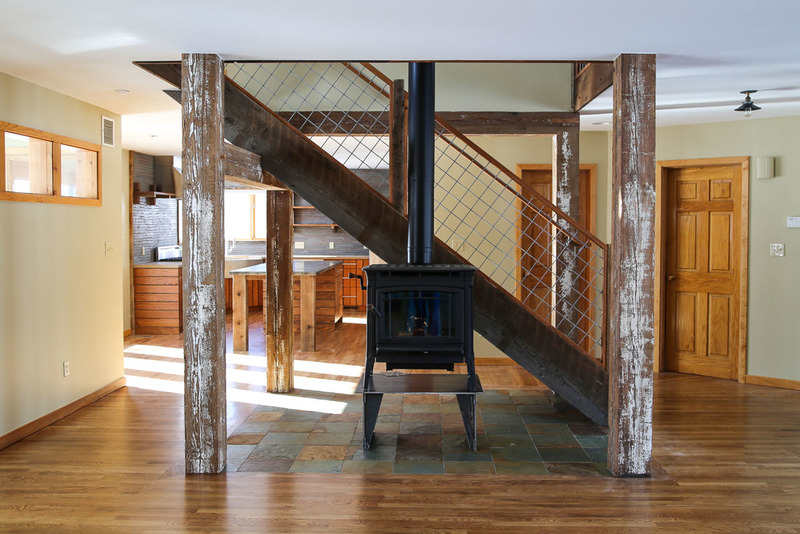 Custom reclaimed timberwork inside and out includes a timber truss front porch and an interior timber stair and railing. A rusty metal wainscot and dark stained cedar siding unify exterior lines and materials. A new woodstove on a raised steel pedestal and refinished, newly stained oak flooring brighten and warm the main living area. Complete kitchen remodel with custom cabinetry, countertops and tile work opens and modernizes the layout, and a complete master bath remodel includes a custom steam shower with teak bench.